External donut tanks are the popular option for today's modern vehicles. East to fit, Easy to plumb. 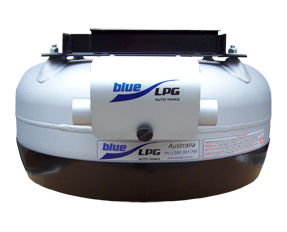 Blue LPG External Donut tanks come with the option of an open face valve guard or a sealed sub compartment. In most applications the tanks are mounted externally underneath the vehicle, but with a the sealed sub compartment they can be installed internally where alternative venting is required. Greater capacity's, maximum LPG capacity for greater range. Liquid withdrawal or Vapor withdrawal available to suit either dual fuel petrol, or Diesel gas conversions.